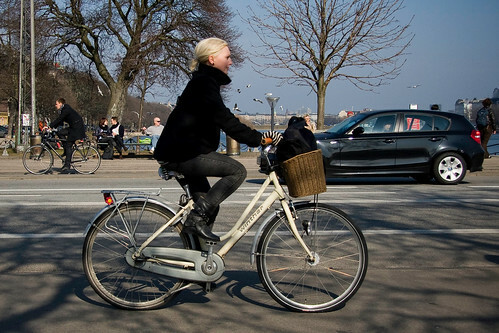 Cycle Chic®: Spring. Printemps. Forår. It's official. Springtime is here. Yesterday was a cracking day splashed with sunshine. There was a still an opaque haze in the air but it was like the last bits of down on a baby bird waiting to fly with its new feathers. Copenhageners, like other fine Nordic folk in the throes of early spring, took to the open air to soak it all up. Drinking beers by The Lakes, occupying benches for no other reason than to enjoy the rays of sun caressing them. Jackets off, gloves begone, hats shoved deep into bags. If springtime isn't smiling while racing pigeons, then I don't what is. The sun on our faces, our hearts lifting, a new season - maybe the best season of all - is upon us. All memories of the harshest winter in almost two decades evaporated in an instant as soon as you stepped outdoors an unlocked your bike. I Live in Rio de Janeiro, and would love to start something similar around here. Our tough season for cycling is our summer, way too hot. So for me it is autum that brings a sense of relief. Around here the bike infrastructure is not the best, but it is growing and improving somewhat. I see more and more people on bikes, and we even have a tradition of tricycles used for delivery of all sorts of goods. I guess the major difference would be on the general sense of elegance and chicness: around here it involves a lot less fabric wrapping peoples bodies. Question: Would you be tolerant with lycra if it comes in the form of bikinis cycling on the way to the beach? Best regards from a city more than eager to share its warmth with the nordic countries. Go SUN, go away!!! Travel north, we've had enough of you around here... Go warm up our brothers to the north. I love that feeling of spring. It's in the air around here as well. Now then, what about some photos of this new two-wheel Christiania I've heard about? Although last week was beautiful, and next week promises to be beautiful, this morning I had to chip ice off my bike to get it ready to go. The pigeon photo is adorable, I swear you have the cutest guys in your country! Well, that's a high end camera used. The guy on the blue one looks he could be in Chicago. The pigeon photo was quite piece of luck. Very humerous. 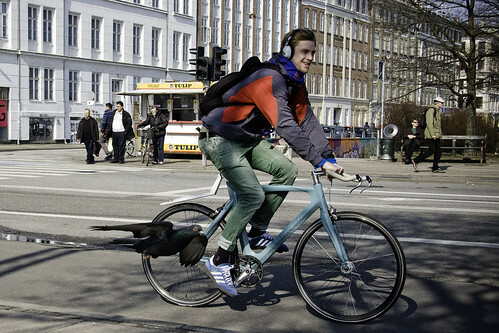 As usual, the Copenhageners continue to inspire with their incredible style. I don't often resort to current jargon but the blue bike the pigeon racer is riding is totally dope. On another note, I have been studying your photos and I don't see bikes encumbered by two and sometimes three bike locks. Here in Valencia, Spain bike theft is an absolute curse. I don't even think it is illegal, at least this is what I gather from talking to the cops after I had a bike stolen recently. I can't believe how much of my day is spent locking up my bikes. In the American west of yesteryear they would shoot horse thieves. I'm not willing to go that far but how about just hitting them with a sock filled with horse manure? It's sort of the Woody Allen meets John Wayne approach.